The mayor of Cleburne said it's a miracle that no one was killed in his town when the tornado touched down Wednesday night. Seven people were rushed to the hospital with minor injuries, with mostly minor injuries like scrapes and cuts from broken glass. No one was seriously injured. 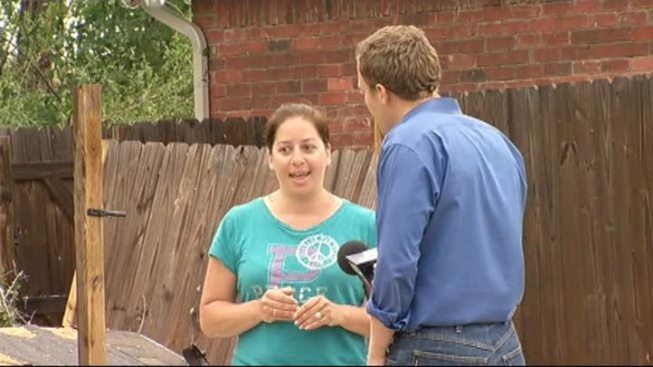 NBC 5 talked to the Alaniz family, who lives on the hardest hit street in the town, Country Club Road. Dozens of houses along that street are damaged. "I wanted it to be over, wanted to make sure my kids were OK," said Melanie Alaniz, a mother of two. When the storm intensified, Alaniz grabbed her husband, her 11-year-old daughter, 14-year-old son and their three dogs and ran into a small interior closet. "I'm just thankful. I know this probably is one of the worst [homes] and I'm just so happy everyone's OK," Alaniz said. Their ears popped in the closet, Alaniz said. They cried. They prayed. And they survived. When asked how to make sense of the devastation, Alaniz replied: "I don't know. You're going to make me cry. I don't know, somebody was watching over us," she said. Devastation is all around Cleburne. Trailers are slammed against garages. Windows are shattered. Roofs are ripped apart. Powerlines are snapped in half. "I thought we were going to die. It was scary," said neighbor Jaime Riffel.